Sparkle and shine in seasonal style from John Lewis. Shop for classic Women’s Partywear and find the perfect ensemble for your evening out. Day-to-night outfitting is made easy with chic layers. Try combining textures and fabrics for a contemporary look. Don’t forget to sparkle with a beautiful range of jewellery to add the finishing touch. Discover classic tailoring with a modern twist for men. Enliven tailoring with unusual colour choices for a party-appropriate look. Click and collect is free from John Lewis Canary Wharf and Waitrose Canary Wharf on all orders over £30, or £2 if you spend less. It’s a 7-day service so you can shop when it suits you. Simply order online before 8pm today for you to collect tomorrow after 2pm. Stay warm and dry this winter with the perfect jacket, coat, windcheater or gilet from Superdry. 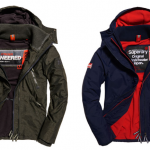 Superdry brings luxury, casualness and wearability together to form truly stylish men’s and women’s jackets that endure. Quality leather jackets, windcheaters and gilets in characteristic Superdry tailoring. Shop their range of harrington, bomber, quilted and parka jackets. Have your order delivered to the Superdry store in Canary Wharf Shopping Centre for free. Just select the Click and Collect option, under the delivery address section of the check-out page. Click and Collect is only available for UK customers and is not available in outlet stores. Shop Women’s Sportswear at John Lewis and update your workout wardrobe now with this season’s freshest arrivals from a range of the best sports brands. Find everything you need from sports tops to trainers plus discover the wide selection of home gym equipment and accessories, catering for all levels of fitness. John Lewis Canary Wharf has free Click & Collect for orders over £30 and free standard delivery for orders over £50. 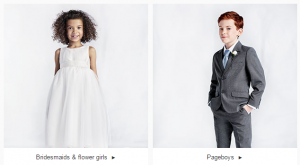 Be sure bridesmaids and pageboys look the part with beautiful dresses and super-smart suits from the selection of Children’s Wedding Fashion at John Lewis. Looking for Bridesmaids & flower girls? You’ll find a delightful selection of pretty dresses and outfits, perfect for little princesses. Looking for a Pageboy? Find smart attire to suit the most adorable little prince.